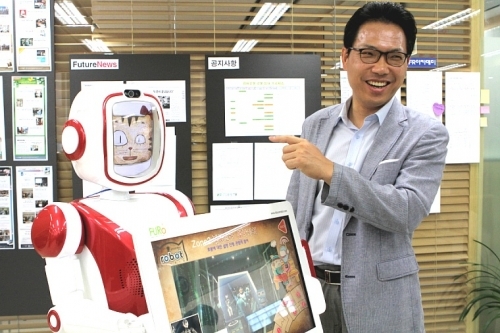 In August 2003, the South Korean government chose ‘intelligent robots’ as one of the top 10 most promising, next-generation growth industries that were expected to help raise the national per capital income to USD 20,000. Ten years have passed since then and over the past decade, several industries on the top 10 most-promising list, such as displays, semiconductors, and next-generation batteries, have become among the world’s best. However, the intelligent robot industry is still wrestling with a tough task of creating private markets that continue to expand. As South Korea’s slow-growing robotics market has been led by a small-sized venture firm which was created just four years ago, that firm has been thrown into the spotlight. The market leader is Future Robot, developer of newly launched advertising robot Furo-D. Future Robot has been on a roll in the domestic market, as well as such overseas markets as Japan, China, Brazil, Singapore, and Russia. Against this backdrop, Korea IT Times sat down with Song Se-Kyong, CEO of Future Robot, a company that aspires to be a “future-oriented business,” to learn about this small but strong robot maker. The South Korean government will this year invest KRW 180 billion in the development of intelligent robots and robot promotion projects aimed for new market creation. On Thursday, the Ministry of Trade, Industry and Energy (MOTIE) held the first Robot Industry Policy Council meeting in Gwacheon, Gyeonggi-do Province, and decided to invest in the development of intelligent robots and robot promotion projects. The Korean government plans to invest KRW 108.5 billion in developing fundamental technologies and convergence-based products, KRW 19.5 billion in efforts to expand the robot market, KRW 35.2 billion in building up industrial infrastructures, KRW 19 billion in robot promotion projects aimed to create new markets, and KRW 120 million in setting up a nationwide cooperation structure this year. A variety of inter-ministerial pilot projects will be conducted to expand robot projects that can create new markets – for example, robots that automatically detect fine cracks in egg shells, rescue robots that can be used to save drowning people, firefighting robots and autonomous flying robots. Aggressive efforts by many nations to recruit science and technology talent have put the spotlight on Korea’s own workforce. New industries like green energy, robotics, biomedicine, and nanotechnology will require highly skilled personnel, but Korea is coming up short in these promising areas. New initiatives like Korea’s “10,000 Plus Plan,” and investments in basic research are trying to address these gaps. Developing new growth engines is an urgent priority for economies around the world. This is prompting more attention to grooming and acquiring elite science and technology (S&T) personnel. Advanced countries and emerging economies alike are mounting efforts to foster personnel that can lead the next-generation growth engines of their economy. 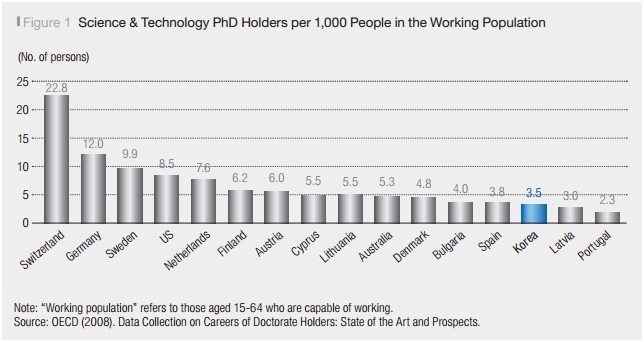 Technology powerhouses, including Japan and Germany, have emphasized home-grown talent. In Germany, the “High-Tech Strategy (Die Hightech-Strategie fur Deutschand)”1 adopted in 2005 seeks to nurture expertise in 17 emerging high-tech industries, including space technology and energy. In contrast, the US and Singapore are investing in attracting top-tier foreign talent. The “American Competitiveness Initiative”2 focuses on promoting high-risk, high-return research and expanding the labor pool for research and development (R&D). Korea is shifting its hiring of S&T personnel from leaders who can drive a “catch-up” business model to leaders who can pursue a “frontier” strategy that leverages next-generation industries. Through this, Korea hopes to stay ahead of emerging market rivals like China on the value chain, while catching up with existing technology powerhouses. For full report see SERI Quarterly. Free subscription required.